June 8, 2015 — George B. Curry, DC, DACS, FICA, LCP (hon.) 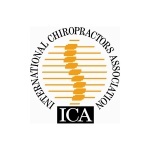 recently stepped forward to serve as the 18th President of the International Chiropractors Association (ICA). A 1982 graduate of Palmer College of Chiropractic in Davenport, Iowa, Curry was sworn into office by Selina Sigafoose-Jackson, ICA Secretary-Treasurer, on May 1, 2015 at the 89th ICA Annual Meeting held in Atlanta. Curry brings an impressive range of organizational and management skills, political insights, and clinical experience to his new leadership position with ICA, including active roles in his local and professional communities and a profound commitment to service. He has energetically contributed to the growth and leadership of the Connecticut Chiropractic Council (CCC), most recently holding the position of Chairman of the Board. Committed to professional development and education in chiropractic, he has served as an extended faulty member for Palmer College, Logan College, Life University, and the University of Bridgeport Chiropractic College. In addition to his private practice, Curry has also served outside the U.S., performing chiropractic mission work in Poland. He is active in patient and public education including regular appearances as a syndicated television host for “Today’s Health.” Curry has provided chiropractic care to many professional athletes and entertainers and has served as a team chiropractor for multiple professional teams including basketball and football. Repeatedly acknowledged for his extensive contributions to the profession and his record of dedicated service, Curry’s many recognitions include being honored as ICA Representative Assemblyman of the Year in 1997, as Chiropractor of the Year by the Connecticut Chiropractic Council in 2000, and with the ICA Leadership and Services Award in 2013. Curry’s professional affiliations include recognition as a Distinguished Fellow of the ICA and receiving the FICA Dedicated Service Award in 2010, as well as being inducted as a Fellow in the prestigious Palmer College Academy in 2009. Curry lives and practices in Windsor, Connecticut with his wife Kerry and their seven children. His oldest son and daughter are Palmer College graduates and his youngest son and daughter are chiropractic students.